And Her Mouseling Friends In This All New Release! It’s Showtime! Grab your seats and enjoy the show with Angelina Ballerina® and her friends in the all-new AngelinaBallerina: On With the Show available on DVD, Digital HD and Video on Demand January 21, 2014 from Lionsgate and HIT Entertainment. The stage is set for big performances and lots of fun! When Ms. Mimi loses her voice, her class finds ways to communicate through music. After a musical mishap, AZ doesn't miss a beat and discovers another way to keep tempo. Gracie learns an important lesson about finding inspiration and Angelina and Polly set the stage for a perfect celebration for their dad. Come along as Angelina and the mouselings let their creativity shine and get on with the show! DVD bonus features include Angelina’s Picture Game & I Will Be a Star Karaoke Music Video! 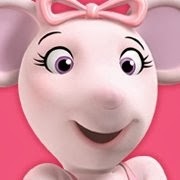 So who in your family loves Angelina Ballerina? 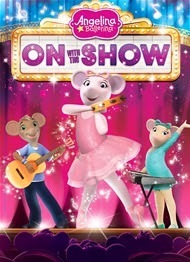 Buy It: Angelina Ballerina, On With The Show DVD can be pre-ordered from Amazon & will be released on January 21st! Win it: One lucky reader will win the Angelina Ballerina, On With The Show DVD!